The Kingdom of Hyrule and the greater world beyond it is made up of many different cultures, each with its own technology level. For this reason, adventurers have access to a variety of armor types, ranging from leather armor to chain mail to costly plate armor, with several other kinds of armor in between. The Armor table collects the most commonly available types of armor found in Hyrule and separates them into three categories: light armor, medium armor, and heavy armor. 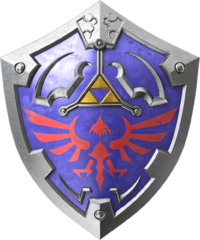 Many warriors supplement their armor with a shield. and enduring form of iron shield. Shield. When you wield a shield in one arm, it increases your AC by a specified amount. You can benefit from only one shield at a time. Strength Requirements. Heavier armor interferes with the wearer’s ability to move quickly, stealthily, and freely. If the Armor table lists entries such as “Str 13” or “Str 15” in the Strength column for an armor type, the wearer is restricted as if they were not proficient with the armor. Armor Enhancements may increase an armor's Strength requirement further. Stealth. If the Armor table shows “Disadvantage” in the Stealth column, the wearer has disadvantage on Dexterity (Stealth) checks made to move quietly. If it shows “Advantage”, the wearer has advantage on Dexterity (Stealth) checks. A tunic is commonly worn over a chain shirt or a breastplate. The cost of such decorative garments can be included in any armor's cost. The Armor table shows the cost, weight, and other properties of the common types of armor worn in Hyrule. The costs and weights of weapons listed on this page should be used if they differ from the pages of individual weapons. A wooden shield is vulnerable to fire damage. When you take fire damage while wielding this shield, the shield is destroyed at the end of your next turn unless you use your action to extinguish the flames. The AC bonus from a deflecting shield is ignored by melee attacks.